For the very first time, a celebrity team is set to fight against a college varsity team in the big court! This Sunday, July 28, 2013, get ready to witness the biggest celebrity sports event that will took place in Makati Coliseum. 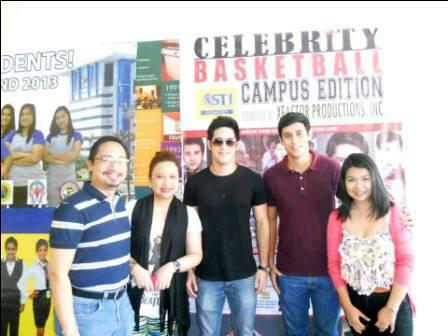 The event is not the usually celebrity basketball wherein each team is composed of celebrity actors. This team, your favorite Primertime celebrities will merge together forming their own Celebrity Team and will fight against the STI Basketball Varsity team. It is a cross-event that will put the hunk actors and the campus heartthrobs on a basketball challenge! The Celebrity Team is composed of the well-loved teleserye actors like Derek Ramsay, Ejay Falcon, Matt Evans, Marco Alcaraz, Jose Sarasola, and Gerald Anderson with the special participation of the PBA icon Bal David. The event is brought together by XFactor Productions Inc. and STI Global College. You may buy your tickets at STI Global College, Symetrique, Sitcom, Avenue 25, or even in the entrance gate of Makati Colliseum on the actual date!